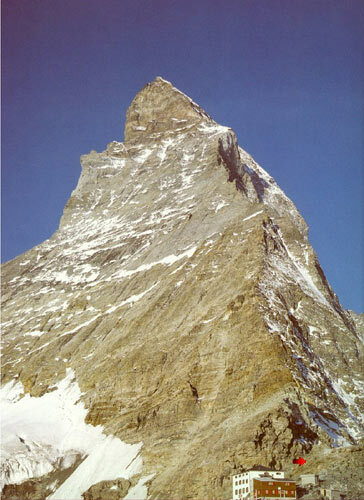 An overview of the lower flanks of the Matterhorn - the arrow indicates the start of the climb. The ascent is no longer considered 'difficult', but be aware that more fatal mountaineering accidents have occurred on the Matterhorn than on any other Alpine peak. Visiting Zermatt? Hike to this stunning view point with the Zermatt Walking Guide.